Today is Michelle Obama's 48th birthday. Happy Birthday FLOTUS! 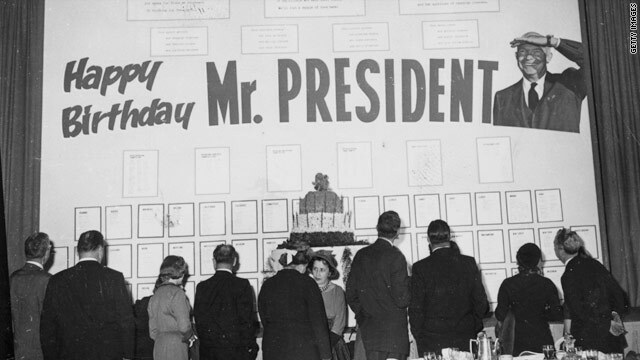 Take a look at a quick history of other famous residents of the White House as their celebrate their special day. Big deal, this won't create any jobs. Best Wishes – First Lady Michelle. I admire your appeal to youth, military families, cultural understand and diversity. Amazing traits in a First Lady! Yes,jesus had to come here to learn what it is we all suffer,its isompsible to judge any sin unless you know all about the said sin.Jesus was tested in many ways,tempted with sin and he rejected sin but he was still tempted,by this in judment we can not say it is not fair,you dont know what is fells like,When in turn all God needs to do is say my son also suffered in this way and knows.Its called perfect judment And yes,love. Happy Birthday to one of our classiest first ladies ever. Happy B'day Mrs. Obama! Dear Mz obama, will you be eating cake and ice cream? I know us fat kids shouldn't have it...but, please have some for us, ok? Happy Birthday First Lady Michelle. I/We all think you are doing a fine job representing the USA and we love you guys! I think you are a confident, elegant, intelligent and accomplished woman all on your own. Enjoy your special day and I hope you get great gifts today. PS. I am wearing my pearls in honor of your birthday.